If you are a cleaning professional — janitor, window washer, housemaid — and were injured while at work, you can benefit from the insight of an experienced attorney. The law prevents you from suing your direct employer for compensation, but you may be able to seek a third-party injury claim against your place of employment or another third party. 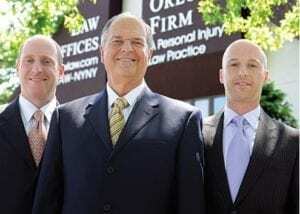 The Orlow Firm has represented thousands of injured people over the past three decades. We can refer you to an experienced workers’ compensation attorney, and we have the knowledge and experience to evaluate and pursue legal claims against third parties whose negligence or carelessness caused a serious accident. Contact us today for a free initial consultation. Call (646) 647-3398 or contact us online. At The Orlow Firm, you will always work with a named partner. We think you should expect nothing less from your lawyer. Cleaning professionals can suffer work accidents in numerous ways. Did you slip and fall on a broken staircase or uneven flooring while cleaning a building? Were you hit by a car while driving to buy or deliver supplies? Did you suffer an illness due to chemicals or lead poisoning at a cleaning job? Did you fall from scaffolding that was improperly assembled by another party? Any of these illnesses or injuries can cause you to miss work and incur medical expenses and other losses. Workers’ compensation can provide some benefits, but you may also be able to hold a third party responsible for your harm. A third-party claim is a personal injury lawsuit filed against a party other than the injured person’s employer. For example, someone working as a contract janitor may be able to file a claim against the owner of the building where he or she was injured, rather than the actual agency for which he or she works. This type of claim does not have the restrictions of a workers’ compensation claim, and thus, it usually results in more financial recovery. At The Orlow Firm, our Queens attorneys have more than 120 years of combined experience and have handled numerous third-party personal injury claims for cleaning professionals. We will provide experienced, results-driven representation to achieve a fair outcome on your behalf. We offer free initial consultations and have four offices across New York City for your convenience. We can go to you if you cannot come to us. Contact The Orlow Firm online or at (646) 647-3398 for more information regarding third-party claims.